Battlefield Hardline takes the long-running shooter series in a different direction, trading war for crime. But EA Chief Financial Officer Blake Jorgensen said recently that the next game in the franchise will return to its more familiar military roots. 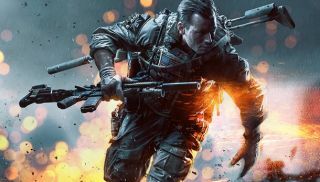 Battlefield 5 will be a "fun, new Battlefield," Jorgensen said at the 2014 UBS Global Technology Conference, via GameSpot. But it apparently won't be all that new: "That will be a return to a Battlefield military-style game; more to come on that," he said. Executive Producer Patrick Bach told the New York Times last year that Battlefield 5 will have "More features. More extras. More destruction," but beyond that, EA has revealed virtually nothing about the game beyond its existence. Even the title is presumptive, of course, and would set Hardline outside the "core" Battlefield franchise. Whatever it's called, we won't lay eyes on it until sometime in 2016.